We're in a post-post-apocalyptic wasteland now. It’s the end of the “end of the world” stories as we know it, because the dismal reviews for the latest Maze Runner movies might just indicate that the dystopian YA bubble has officially burst. We’re all in the apocalypse now. Hunger Games, Divergent, and now Maze Runner. Hollywood hasn’t tired of dumping millions into adapting young-adult fiction series to the big screen, but at long last audiences are seemingly over the trend once and for all. The third and final Maze Runner film, The Death Cure, came out on Friday and with it came a slew of overwhelmingly negative reviews. It doesn’t help the franchise that its star, Dylan O’Brien, suffered a significant injury while filming The Death Cure, one that ultimately delayed the production for about a year. The last entry for the franchise, The Scorch Trials, came out in 2015. Here in 2018, viewers don’t really care about YA dystopias anymore, and they sure as hell don’t seem to care about The Maze Runner. We all should have seen this coming, considering the mediocre reception the end of the Hunger Games franchise received from critics and viewers alike, and again when the Divergent film franchise withered away until it lost all its stars and settled for what’s essentially an upcoming TV movie. Meanwhile, on actual TV, shows like The 100 don’t enjoy the same popularity they once did. So just how bad is The Death Cure? The Maze Runner finally gets to stop running. Over on Rotten Tomatoes, The Death Cure is sitting uncomfortably at 44 percent on the Tomatometer. It’s hard to argue with Peter Travers writing for Rolling Stone when he wonders, “why imagine terrible futures when we have Trump to remind us that the end of the world is coming?” He calls the film an “assault of fire and fury guaranteed to leave your senses frayed and your brain numb.” Ouch. Peter Bradshaw’s review for The Guardian labels the film a “sexless derring-do in a dull YA dystopia,” saying it offers a generic sandy dystopia with “a story that lost its identity once the titular maze was left behind.” The whole thing is corporate villainy versus a generic Resistance. For Slashfilm, Karen Han praises the action sequences offered by director Wes Ball, who delivered “Mad Max-ian” action in a finale that’s “pretty okay.” So it’s not exactly glowing praise. 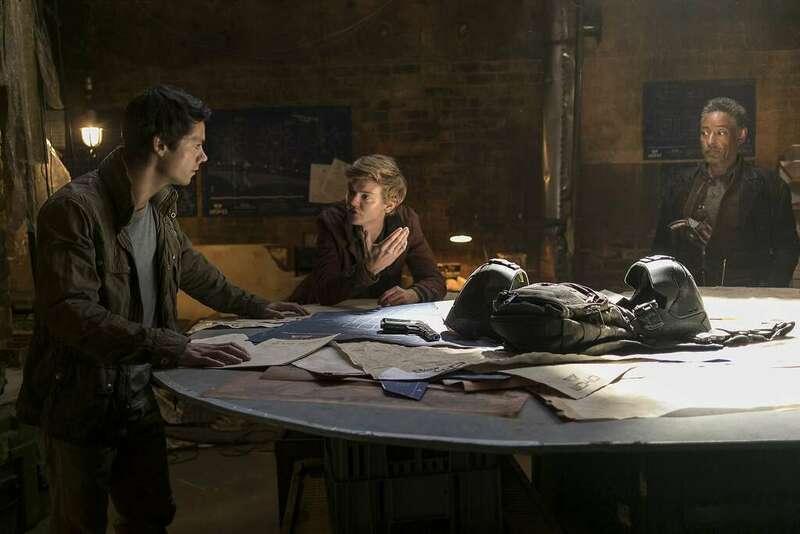 Resistance planning looks stressful in 'The Death Cure'. Ultimately, The Death Cure’s overuse of typical dystopian tropes and repeated character dynamics is about as tired as its hero, Thomas, must be after running through a maze, a desert, and now a walled city trying to kill some corporate overlords. YA dystopian stories have apparently run their course in cinema, but hopefully, it won’t affect the excellent Dylan O’Brien’s action career moving forward. We’re left to wonder how this overall trend with dystopian films might bode for the upcoming Ready Player One, which depicts a very different dystopia steeped in VR. Can pervasive ‘80s nostalgia, Steven Spielberg, and cool technological trends prevent the same negative public opinions from happening? We’ll see. The Death Cure is out now in theaters.